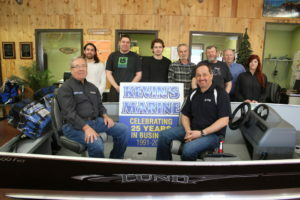 Kevin’s Marine Ltd. is a complete Boat Sales and Services Dealership serving Saskatchewan and Western Canada since 1991; our friendly, professional and expert staff have over 100 years of Marine experience. We have worked hard at creating a well respected reputation, in the boat sales and service community. Plus Warren and Victoria in our Service Department, and Brian in our Parts Department! Announcing – the newest member of our team, Bryan (yes another one) in service! Come for a visit…check out our showrooms…the coffee is always on! We have an 11,000 square foot showroom and full 4 bay service centre, fully stocked parts department, and a large off-season storage facility nestled in the scenic Qu’Appelle Valley. Kevin’s Marine has received numerous awards for Sales and Achievement in promoting the Lund, Larson, Harris Flotebote and Four Winns boats and pontoons! We offer a complete line of water sport accessories from O’Brien, LA Ski, Jet Pilot and Monster Tower, and many other manufacturers! For the fisherman we handle MinnKota trolling motors, Humminbird Fish Finders and Sonars. Plus just about anything else you’ll ever need for your boat or boating fun. OUR GOAL IS TO PROVIDE YOU, OUR CUSTOMERS, WITH 100% SATISFACTION AND A PLEASANT EXPERIENCE WHILE VISITING OUR STORE, AND USING OUR PRODUCTS. AT KEVIN’S MARINE WE GUARANTEE EVERYTHING WE SELL! 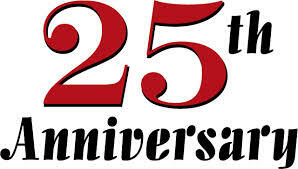 IT’S HARD TO BELIEVE, BUT IN 2016 WE CELEBRATED 25 YEARS! AND WE WERE HAPPY YOU CELEBRATED WITH US! WE HAD LOTS OF SPECIALS AND ACTIVITIES, THROUGHOUT THE YEAR, TO THANK OUR CUSTOMERS FOR THEIR CONTINUED SUPPORT!